Don't fear the Reaper in this tasty, hotlicious hot sauce. 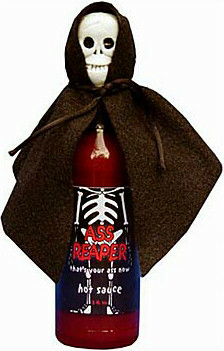 This hot sauce comes with the Reaper on top of the bottle and the black cape to match. Ingredients include: Habaero peppers, African olesoresin, Scotch Bonnet peppers, salt, onion, vegetabel oil & garlic. Made with mothers love.